Millions of years ago, before there were red-breasted robins and busy blue jays...there were feathered dinosaurs. Scientists have found evidence that Anchiornis, Caudipteryx, Confuciusornis, and many more dinosaurs all had feathers. Discover these amazing ancient creatures - and the connection between feathered dinosaurs and modern birds! 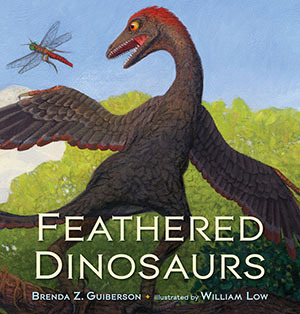 "By drawing upon recent discoveries of the many different kinds of feathered dinosaurs, Guiberson gives children multiple examples of the links between modern birds and their prehistoric counterparts." Grades 2-5 - "Considering the flood of feathery dinosaurs being unearthed in newly found fossil beds, this attractive addition is timely. Guiberson's brief, informative paragraphs of text are accompanied by Low's soft-edged, realistic oil and acrylic paintings, presenting a baker's dozen of feathered (and nonfeathered) critters, all demonstrating the evolutionary path from toothy therapod to the raucous blue jays fussing at backyard feeders.